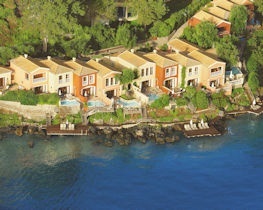 Set amidst lush landscaped gardens on a pine filled peninsula in Kommeno, sophisticated Grecotel Eva Palace enjoys views over the sea and offers discreet, intuitive service and a peaceful ambiance. Bright and elegant guest rooms and suites feature four-poster canopy bed, glass-wall bathroom and balcony or terrace; in addition there are luxurious villas with private pool. The main restaurant with open-air veranda offers a buffet for breakfast and evening dining, the La Contessa features an a la carte menu of international dishes, whilst the poolside restaurant serves fine sushi and steaks. Nestling in the garden the impressive pool landscape features a swim-up bar and plenty of loungers dotted around the sun terrace, a path leads down to a secluded sand and shingle cove and there are watersports available for hire. The spa is ideal for a massage treatment, there are tennis courts and a range of fitness classes and, in high season, a mini club for youngsters. 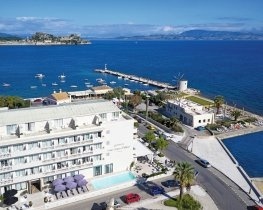 Guests dining half board have the opportunity to dine at participating restaurants across 3 hotels on the Kommeno Peninsula (Grecotel Corfu Imperial, Grecotel LUX.ME Daphnila Bay Dassiaand all restaurants at Grecotel Eva Palace). Guests can select dishes from set menus without a charge or dine a la carte with a supplement of €20 per person & €10 per child. Some restaurants do not have a set menu and include a la carte supplement only.